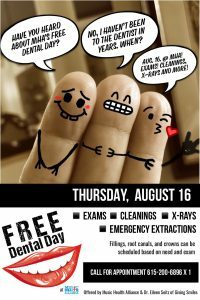 CLICK HERE to request an appointment for MHA’s FREE Dental Day, or CALL MHA at 615-200-6896 x 1 to request an appointment. SERVICES: Exams, Cleanings, X-Rays and Emergency Extractions provided onsite. If there is a need for fillings, crowns, root canals, etc. a follow-up will be scheduled.